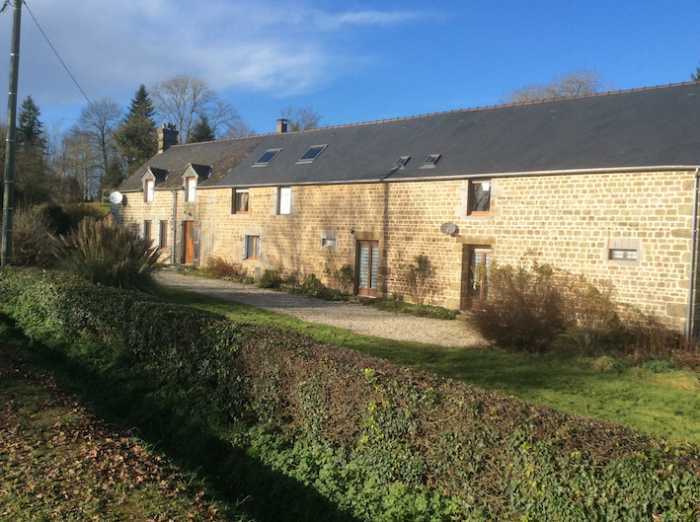 The property is a traditional Normandy Longhouse which has been completely renovated and offers a light and versatile living space. It is divided into spacious owners' accommodation, a 3 bedroom gîte and a 1 bedroom ground floor gîte. Since 2002 the property has seen a vast programme of improvements including the Kitchen/Conservatory extension, re-wiring, some new windows and doors, a new oil fired central boiler, re-pointing, the whole of the loft area has been insulated with air flex insulation and a new roof over the gîte section of the house. Viewing is highly recommended. The property is found in Orne in the Normandy region of France. It stands on the edge of the Andaines Forest (Foret des Andaines) in the Normandy Maine Regional Park (Parc de Normandy Maine). The surrounding countryside is ideal for outdoor activities. It is just 5 kms away from the small town of La Ferte- Mace, with a range of shops and restaurants, plus a beautiful lake with a sandy beach offering water sports, fishing and supervised swimming. Only 10 kms away is the charming spa town of Bagnoles-de-l’Orne, with its thermal baths, a good choice of restaurants and shops, sports facilities, a lakeside casino and golf course. The closest airport is Deauville Airport (88 km) also nearby are Rennes Airport (121 km), or Dinard Airport (128 km). The closest ferry ports are at Caen Ouistreham (1 hour's drive), Le Havre (1 1/2 hours' drive) and Cherbourg (2 hours' drive). Within easy reach from the property is the Memorial de Caen (65 km), Bayeux Tapestry (Musée de la Tapisserie de Bayeux) (76 km), Le Mans Cathedral (79 km), or The Old Town of Le Mans (80 km). Entrance Hall 3.21 x 2.72m Partly glazed door to front elevation. Oak flooring. Stairs to first floor. Exposed stone wall and beam. Radiator. Lounge 5.96 x 5.71m Exposed beams. 2 windows to front elevation. Tiled floor. Window and glazed doors to conservatory/kitchen. 2 radiators. Granite fireplace with wood-burner. Study 2.50 x 1.82m Radiator. Laminate flooring. Window over kitchen. Utility Room 3.10 x 3.10m Glazed door to rear and east and Velux window to rear elevations. Built-in broom cupboard and pantry. Base and wall units. Double ceramic sink with mixer tap. Space and plumbing for dishwasher and washing machine. Space for upright fridge/freezer. Radiator. Tiled floor. Inset spotlights. Wet Room 3.03 x 1.00m Tiled floor and walls. WC. Heated towel rail. Extractor. Hand basin. Inset spotlights. Shower. Landing Oak flooring. Window to front elevation. Exposed beams. Radiator. En-Suite Bathroom 2.64 x 2.36m Velux window to rear elevation. Tiled floor. Partly tiled walls. Heated towel rail. Suspended WC and bidet. Jacuzzi bath with 2 mixer taps/shower fitments and screen. Vanity unit. Hobby Room 6.24 x 5.90m 2 upright radiators. Oak flooring. Glazed double doors to rear elevation and balcony and covered stairs to ground floor. 2 windows and 2 Velux windows to front elevation. Exposed stone wall and “A” frame. En-Suite Bathroom 3.04 x 1.50m Bath with mixer tap/shower fitment and tiled surround. WC. Pedestal basin. Hot water cylinder. Open plan Living Room/Dining Room/Kitchen 5.06 x 4.84m Glazed double doors to front and glazed door to rear elevations. Ornamental fireplace. Radiator. Electrics. Exposed beam. Pine corner kitchen area with matching base and walls units. Worktops and tiled splash-backs. Space for free standing cooker with extractor over. Single stainless steel sink with mixer tap. Space for upright fridge/freezer. En-Suite Bathroom 2.56 x 1.61m Bath with mixer tap/shower fitment and tiled surround. Exposed beam. Vanity unit. WC. Tiled floor. Heated towel rail. Extractor. Laundry Room/Boiler Room 4.15 x 1.86m Sink unit. Boiler. Tiled floor. Storage cupboard. Space and plumbing for washing machine. 2 hot water cylinders. Open Plan Living Room/Dining Room/Kitchen 5.79 x 4.29m Glazed double doors to front and glazed door to rear elevations. Radiator. Stairs to first floor. Decorative fireplace. Kitchen Area with pine matching base and wall units. Worktops and tiled splash-backs. Space and plumbing for dishwasher. Built-in oven and 4 ring gas hob with extractor over. Exposed beams. En-Suite Shower Room 2.74 x 1.82m Window to rear elevation. Shower. Convector heater. WC. Pedestal basin. 2 hot water cylinders. Landing Window and skylight to front elevation. Exposed stone wall. Hatch to loft. Radiator. En-Suite Bathroom 2.97 x 1.49m Bath with mixer tap/shower fitment and tiled surround. Pedestal basin. WC. Hot water cylinder. En-Suite Bathroom Bath with mixer tap/shower fitment and tiled surround. Vanity basin. WC. Conservatory – dining area for Gites 4.70 x 4.59m Tiled floor. Glazed double doors. Windows on three sides. Block built Shed with 2000 litre oil storage tank. Shared patio. For the main house there is a terrace surrounded by dwarf wall and flower beds. Loggia. Outside tap. Wood store. The garden is laid to lawn with mature trees. Patio areas with outside lighting. Garden Shed and Greenhouse. Mains water, electricity and telephone. Drainage is to an all water septic tank. Oil fired central heating. Satellite internet connection.